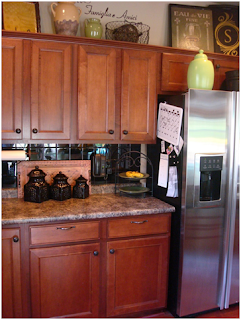 What should you do with the awkward space above kitchen cabinets? This is a good question, as it is tricky to decorate, and a fairly common inquiry from my family and friends. Thank you to my good friend, Meghan Fiorina, for suggesting I blog about it! 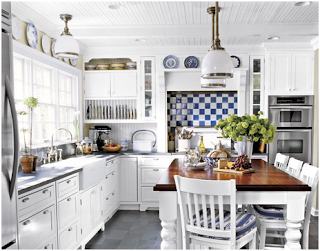 First off, unless your kitchen’s style is country, the use of baskets & plants should be avoided (Sorry Mom!!). I personally would take a simple approach, as I feel you want to focus on the overall design of the kitchen and not detract from it. One of the simplest ways to enhance the space above the cabinets is to just add rope lighting above to create a nice ambiance. 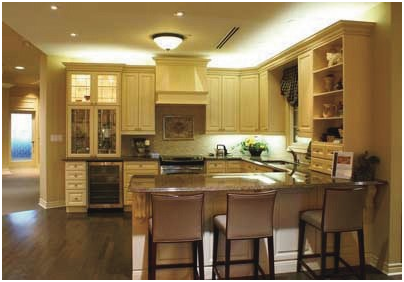 Such warmth is added with the lights above the cabinets in this kitchen. If you are looking for something a little more decorative, than you can do this with plates & pottery. 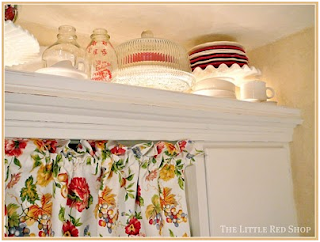 Again, more often than not, less is more when you are looking to decorate above your cabinets. 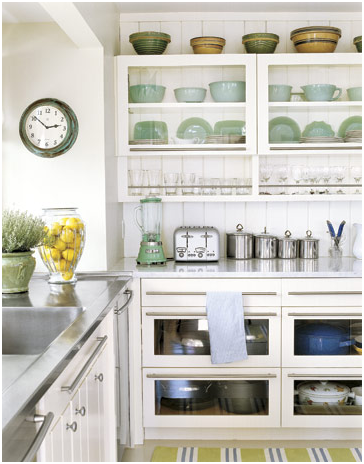 The items above your cabinets are merely just an accent to what beautiful space you already have. If you want to bring in a little color than plates are a good place to do so. In this case the plates are all uniform in size, and vary slightly from pattern to pattern. This pewter collection is showcased on top of these cabinets, and backed by various white plates. The plates behind the pewter add a little depth, and still the monochromatic scheme is subtle. 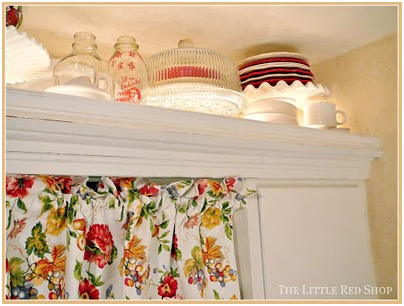 I always tell people that decorating above your cabinets should be similar to decorating your mantle. 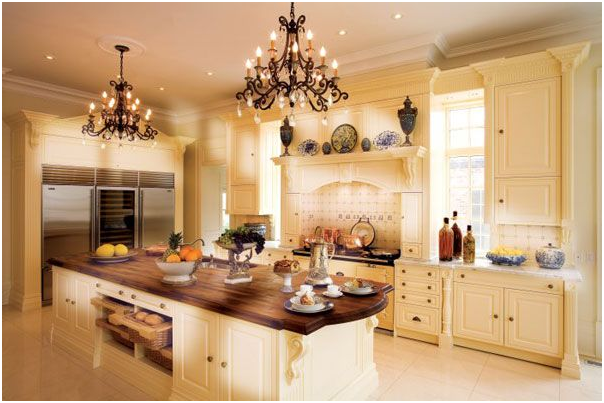 You want it to accent what you are decorating, not deterring from it. 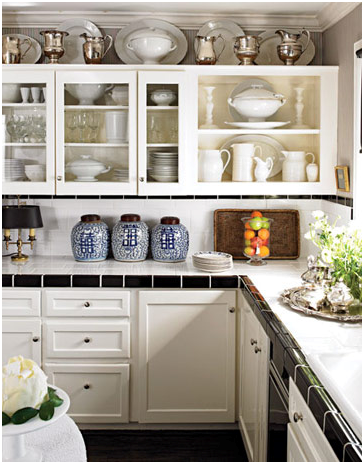 The beautiful pottery and serving ware looks beautiful on this hood mantle. Both lights and servingware are used in this application. The lights behind enhance the plates, cake stand, etc. and give some more interest. Due to the lack of molding, the cabinet simplicity allows these cabinets to act like a shelf above. While using similar pottery and china as what is in the cabinets, you hardly notice the majority of china is inside the cabinets. Have any more ideas on how to decorate the space above cabinets? Please share your ideas as I would love to hear them!